Hi, how it's install this? 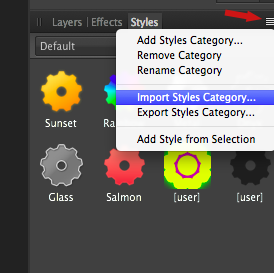 Choose the .afstyles file from the dialog and you should see the new styles on the Styles panel (check the dropdown to change between categories). Thanks Chris, really nice work. Newbie Here :) . Thank You for these Styles. I just switched from Illustrator to Affinity. Just 10 mn using it, and fell under the spell. I have to look how to import all my palettes from photoshop and the rest.. thanks for sharing your importation technique. do you know, whether the format of styles have been changed recently? When I try to install them, I get an error message saying, that the style may be corrupted. Fantastic !!! Thanks for sharing !!! thank you Chris, so generous. I am new at creating brushes and styles but would really like to know how to make them. Have had some success creating brushes. I noticed that one needs to start in photoshop, don't have it, so can one create styles from start to finish in AD or AP? Yup, you sure can. version 2 of these styles, and all of my other styles, were created solely in Affinity Designer. Thank you so much, Chris. They are just wonderful. I have downloaded the ad document and have not any problem in testing the colour ones and even just put some of them into my app. But I do not know how do it with the metallic ones. And they are gorgeous.!!! It would be great if you could make us have a affinity designer document, that we can open freely in the app and then, just import the styles into our computer. Cannot manage to open the zips. No problem with the atmosphere style at all. They are so luminous and magical! Thank you so much for your wonderful styles. Love the organic ones so much. I have some difficulty. I cannot load the styles into affinity. The are not recognized as loadable when I click on them and do the loading. Then I saw that it seemed that photoshop could do the loading once I cliked on "open"...but once I got into photoshop It said that the file was not recognized by Photoshop, even it was clickable. How can I get the zip style files into AD ir AF.? Sorry for the comment. I know How to do it. Thanks for your generosity and attention.